YOU HAVE GOT TO BE KIDDING ME! I just got notice that my Cottage Living would be added on to my Southern Living subscription, and I saw that Nancy Soriano had stepped down (along w/ tons of other long time employs), but I had no idea Country Living was going under. It was my FAVORITE MAGAZINE of all...and my style isn't even country. I'm sad now. :O( Boo Hoo!!! country living is not leaving. not yet anyways. I subscribed to Country Living.....got one edition and then received a post card saying that the magazine is no longer being printed and that I will now be receiving Southern Living. I don't want Southern Living.. Boo-Hoo!!! I just got my first copy of SL and was not happy. Oh Well!!!! I try really hard not to sweat the small stuff.. I have one thing to say UGH!!! Thanks for visiting my blog and for leaving a sweet comment. First, let me say welcome to blogland. I've only had mine since Dec 08. I just love your blog banner. Please stop by anytime and I will keep my eye on yours too. Print media seems to be suffering -- not only magazines but newspapers. Advertising dollars are not going to print which is why they are struggling. I refused to transfer my Cottage Living subscription over to SL -- requested a refund!!! 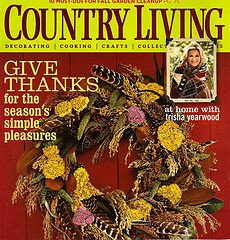 I think we may lose some more -- I'm not country either but I did like both Country Home and Country Living -- did not subscribe but would buy an issue or two when I liked what I saw inside. Aha!! another magazine addict. I think as far as addictions go it's a pretty good one to have. Not fattening, educational, and stacks of them make a trendy night table. I don't subscribe to any I just go to the local bookstore, enjoy a Starbucks and then lug them home. There you go-you can also use them as weights! !